Change is in the air for healthcare. How will reform affect social workers and their clients? Perhaps no piece of legislation has engendered more debate, consternation, and confusion in recent years than the Patient Protection and Affordable Care Act, which President Obama signed into law in March 2010. But no matter your personal views on healthcare reform, it is clear that the new law has the potential to significantly affect social workers and their clients. As the legislation’s first batch of provisions is implemented, social workers are assessing what healthcare reform means for the profession overall and for providers in particular practice areas. They are finding that reform provides many new opportunities for social workers, although many questions remain about how and when these opportunities will present themselves. • a $250 rebate to older adults affected by the “doughnut hole” coverage gap in their Medicare prescription drug benefit. Beginning in 2011, a series of changes will begin that are aimed at providing insurance coverage to millions of uninsured Americans. These changes include the creation of health insurance exchanges to facilitate the purchase of coverage by individuals and small businesses, the expansion of eligibility for Medicaid coverage, tax credits to help people purchase coverage, penalties for some employers that do not offer health insurance, and a requirement that all U.S. citizens and legal residents have health coverage. The reforms will reduce the number of uninsured people in the United States by 32 million by 2019, according to estimates from the Congressional Budget Office. About 23 million residents will remain uninsured. The reform also includes provisions that promote the expansion of home- and community-based services, chronic disease prevention, wellness programs, and efforts to eliminate healthcare disparities. On a broad level, healthcare reform will affect all social workers, no matter their areas of practice. That’s because reform will increase millions of Americans’ access to medical services, thus empowering clients who previously faced barriers to preventive care. Social workers have long recognized the connections between access to such care and physiological, economic, and social functioning, says Stephen Gorin, PhD, MSW, a professor of social work at Plymouth State University in New Hampshire. The reforms also could usher in greater acceptance among healthcare professionals of social work’s person-in-environment perspective. The reforms’ emphasis on concepts such as patient empowerment, preventing hospital readmissions, medication management, and the integration of home- and community-based services is compatible with the social work approach, says W. June Simmons, MSW, founding president and CEO of the Partners in Care Foundation, a California-based organization that promotes innovation and collaboration in healthcare. Beyond these overall changes, there are many ways in which health reform will affect social workers in particular practice areas. For example, reform could open new career opportunities for social workers in healthcare by continuing the push toward delivery models that integrate primary care and behavioral health. This means social workers and other behavioral health professionals could become more prevalent in primary care settings such as community-based clinics, Simmons says. That shift could have a significant impact on private practitioners. As social workers become more integrated into community settings, practitioners working individually in private offices could become less prevalent, Groshong says. Working in a clinic or other primary care setting may mean a loss of autonomy for social workers who otherwise would be private practitioners, but it also means fewer headaches with administrative issues such as billing, she says. Other changes private practitioners may see in the next few years will revolve around issues such as reimbursements, electronic health records, and personal health records. 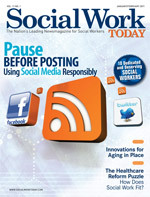 Many changes also are on the horizon for older adults and the social workers who serve them. The change with the most potential to help such clients and providers is the Community Living Assistance Services and Supports (CLASS) Act, says Morgan Gable, MSW, policy analyst for home- and community-based services for the American Association of Homes and Services for the Aging. The voluntary insurance program is funded through payroll deductions. Once a person pays into the program for five years and is faced with functional limitations, he or she can tap the program to help pay for assistance with activities of daily living, transportation, home modifications, and related services. The CLASS Act is only one provision likely to benefit older adults, Gable says. The reform legislation also gives states the opportunity to expand older adults’ access to home- and community-based services under Medicaid. In addition, new pilot and demonstration programs aimed at improving services to older adults will foster coordination, efficiency, and innovation among service providers. Substance abuse treatment providers are trying to determine how reform will affect how they do business. Although many of the details about how reform legislation will affect providers have yet to be hammered out, providers expect that reform will lead to more requests for services because it will allow more people to access insurance coverage that covers behavioral health services, says Kenneth S. Ramsey, PhD, president and CEO of Gateway Rehabilitation Center in Pennsylvania who is also chairman of the public policy committee for the National Association of Addiction Treatment Providers. Gateway is preparing for the increased demand for services, especially services for adolescents and older adults. The organization plans to begin construction this spring on a 25,000-square-foot building that will more than double its capacity for youth and adolescent clients and allow it to serve more adults. Gateway expects to hire more therapy staff, paraprofessionals, and support staff as well as provide more training to staff on topics such as the needs of older adults, Ramsey says. And as Gateway pursues expansion of facilities and staff, it also expects to increase its efforts to educate its clients and their family members about what healthcare reform means for them. Observers agree that social workers’ roles as educators will be vital to the success of healthcare reform. One has to look back only a few years to the confusion surrounding the implementation of the Medicare prescription drug benefit to appreciate how much work it will take to help people understand the benefits they are entitled to under healthcare reform, says Andrew Sperling, JD, director of legislative affairs for the National Alliance on Mental Illness. One important role social workers may be called on to play is dispelling myths about the legislation that surfaced during the battle over healthcare reform, Gable says. For example, older adults may continue to be concerned about claims that the legislation calls for “death panels” that will determine whether a person should receive medical services based on his or her level of productivity in society. The first step social workers can take in becoming effective educators is to educate themselves about healthcare reform. The federal government’s health reform website, www.healthcare.gov, and the Henry J. Kaiser Family Foundation’s Health Reform Source website, http://healthreform.kff.org, are often-cited sources of information about the reforms and the timeline for implementation. Other websites recommended by observers include AARP, www.aarp.org/health/health-care-reform; and the Center for Policy Analysis, www.centesrforpolicyanalysis.org. Although trying to sort through the ins and outs of healthcare reform may be a daunting task, it is important that social workers are knowledgeable enough to properly advocate for reform in the face of efforts to repeal it or water it down, Gorin says. — Christina Reardon, MSW, is a freelance writer based in Harrisburg, PA, and contributing editor at Social Work Today. Even before President Obama signed the Patient Protection and Affordable Care Act, opponents vowed to repeal it. And with the recent midterm elections increasing Republicans’ power in Congress, concerns about the future of the legislation have intensified. The election results are not cause for panic, though; the consensus among observers is that the legislation will not be repealed. Opponents of reform do not have enough support in Congress to repeal the legislation, Doonan says. It would take 60 votes in the Senate to repeal large sections of reform, and Democrats still control that body. Even if repeal passed Congress, President Obama could veto it. But that doesn’t mean the reform is entirely safe. Opponents still could attempt to derail particular provisions of the legislation through denying the funding or staffing necessary to implement them, says Stephen Gorin, PhD, MSW, a professor of social work at Plymouth State University in New Hampshire. For example, some states may refuse to set up health insurance exchanges where individuals and small businesses can purchase coverage. Opponents also could mount court challenges to the reform. In addition, it is possible that some insurers and businesses will try to get around the law. The U.S. Department of Health and Human Services has already granted waivers to companies that have objected to the law’s requirements to phase out annual limits on coverage, saying it would force them to drop coverage altogether. Perhaps surprisingly, public opinion could make it easier for the Obama administration to keep the health reform legislation together. Many people who are dubious about reform may begin to change their minds as more of the legislation’s provisions are implemented, Gorin says. So health reform appears safe—at least until the presidential election of 2012, says Kenneth Ramsey, PhD, president and CEO of Gateway Rehabilitation Center in Pennsylvania. “If a Republican is elected president, then all bets are off,” he says.